Bobby the kitten has made a full recovery after being accidentally trapped in a washing machine in Nottingham. Across the pond, space experts have been left divided over a mysterious fireball, spotted coasting across the night sky by onlookers in Nevada, Utah and California. And if you’ve ever doubted the power of social media, the money raised by the unforgettable #IceBucketChallenge circa 2014 has helped researchers identify a new gene associated with ALS. Now over to the world of tech and ecommerce. From Google AdWords updates to Unilever buying the California-based, kooky shaving brand Dollar Shave Club, it’s certainly been an interesting week. Here’s a closer look at the 4 stories all you ecommerce marketers should have read. Ecommerce company Flipkart is set to buy Indian fashion and lifestyle ecommerce portal Jabong. The online retailer will reportedly go for $70 million to make India’s “biggest fashion e-commerce business”. According to Business of Fashion, Flipkart will merge the business with its Myntra unit, engendering a company with a base of 15 million active users who shop brands such as Topshop and Swarovski. Does a week go by without news from Google? The tech giant has now revealed that cross-device conversions will soon be automatically included in the Conversions column. Google launched cross-device conversions three years ago, to enable marketers to “fully measure multi-device consumer journeys that start with an ad click on one device...and end with a conversion on another”. Then, in 2015, Google “made cross-device conversions more actionable” by “allowing them to be included in the Conversions column and integrated into … automated bidding and attribution models”. And now cross-device conversions are set to be automatically included in the Conversions column, thus offering marketers “the most complete view of performance possible”. According to a recent AdWords blog post, this new feature will be available to advertisers from 6th September this year. Thereafter, the existing setting to “manually” include cross-device conversions in the Conversions column will cease to be available. Furthermore, after 16th August 16, 2016, “new AdWords accounts will include cross-device conversions in the Conversions column as the default”. 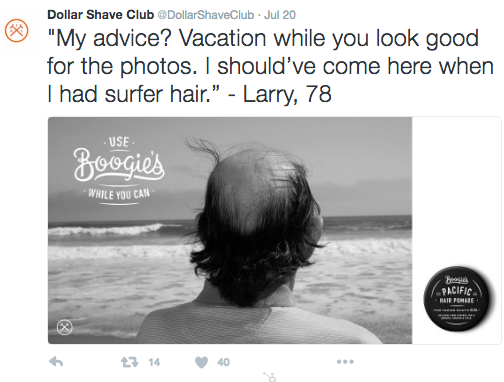 Anglo-Dutch multinational consumer goods company Unilever is to purchase the California based startup Dollar Shaving Club (DSC). The startup was founded five years ago by Mark Levine and Michael Dubin and reportedly already has sales of $152m. According to The Telegraph, Dubin (the one who features in the company's humorous videos), will stay on as chief executive following completion of the deal. Back in 2004, who would’ve thought Facebook would go on to become the king of social networks? The company has revealed yet another excellent quarter, earning $2bn from April to June this year and bringing in $6.4bn in revenue. Moreover, the number of monthly-active-users has rocketed to 1.71 billion (as of 30 June 2016). Interestingly, Co-founder Mark Zuckerberg said the company is particularly chuffed with its progress with video due to its increasingly important role in advertising. "We're particularly pleased with our progress in video as we move towards the world where video is at the heart of all our services," he said. According to the BBC, the company is “encouraging” businesses to use video and is introducing new advertising platforms for mobile ads. Meanwhile, Twitter shares dropped 12% after reporting its own quarterly earnings.